Named for an iron industrialist at Nashville, Tenn., and owned by the Ryman Line, the handsome sternwheeler J.P. Drouillard was a product of the Howard Shipyard at Jeffersonville, Ind. Constructed in 1881 for a contract cost of $7,000, the wooden hull measured 165 feet in length and 31 feet in width, with a depth of 4.9 feet. Much of the equipment was recycled from the upper Cumberland River packet Bolivar H. Cook, also built by Howard in 1873 and dismantled in 1880. The new steamboat ran weekly from Nashville to New Madrid, Mo., a round trip of approximately 660 miles. The usual freight carried aboard was 7,500 sacks, each of two bushels and three pecks. The master of the vessel was Capt. W.R. Gracey. One of the regular pilots aboard the Drouillard was Capt. Raff Moss, of Dismal Mound Hill (above Smithland) who was reportedly a full-blooded Indian and one of the best pilots on the river. The other pilot was Capt. Clem Matheney, of New Albany, Ind., who died suddenly while at the wheel. Other crew members included Hugh Moore, chief engineer; Joe Jones, second engineer; Dave Atkinson, clerk; Jolly Hard, second clerk; Harvey Carroll, head mate; Jim Oarell, steward; and Robert Grissom, second mate. Capt. Gracey suffered a stroke while aboard the Drouillard in 1889 and was taken off by the steamer E.G. Ragon, which took him home to Eddyville, Ky; he died later that year. Capt. Gracey’s father was said to be of one of the founders of Eddyville, along with the Ryman family. Gracey’s brothers, Matt and Frank, were the largest tobacco and grain transfer dealers on the Cumberland River. They owned the wharfboat at Clarksville, Tenn., as well as the sternwheel packet Julien Gracey, built at Clarksville in 1880 (100 feet in length by 22 feet in width) which had a light draft (3 feet) and operated up the Red River, a tributary of the Cumberland, as late as 1886. Capt. Gracey had three daughters and one son, who passed away in the 1950s. Official inspection records show that the J.P. Drouillard was last inspected on December 22, 1891, at Nashville. 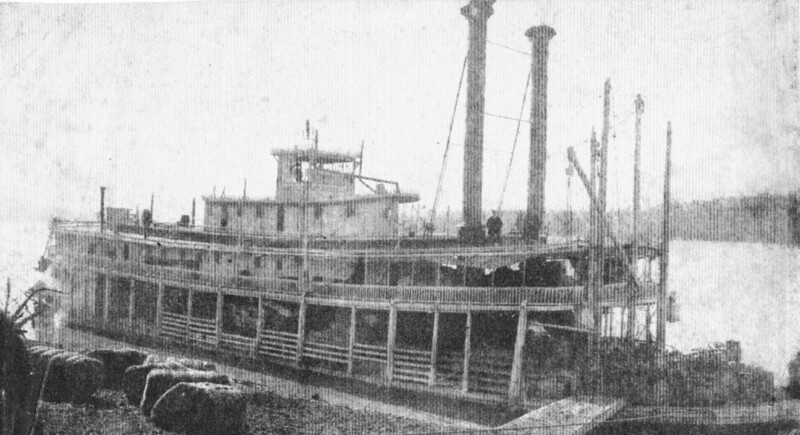 The steamboat was last listed on the 1892 edition of the List of Merchant Vessels.